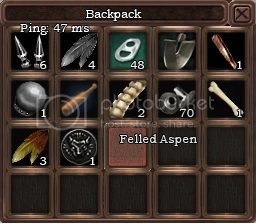 Thread: You've found something "useful"
Yup Felled aspen and willows are appearing everywhere haha. dismantle a building..get a free willow, make a brick and win a felled aspen. its a lottery. lucky not a critical bug tho, can just drop it out of the packs. Dirt is funny on a player who has no access to shovels Kill + Fill Bags with dirt, Lol At him Run. Maybe it's an attempt to fix the logs that fall below the surface when you chop them, they are just distributing them into inventories at random. lol. That seems like a good way to get rid of a player that wont stop bugging you, just take there shovel and put dirt in there inventory. Haha yea dirt works better cause you can't delete it... that's pretty funny. My PO weapon is a shovel . Saved.